Paddy's Palace Belfast v Belfast, Severní Irsko: Zarezervujte nyní! 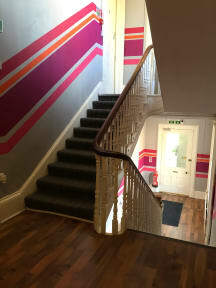 Newly renovated, bright social hostel with a lot of character for backpackers ! Best-value-for-money in all of Northern Ireland. We cannot be beaten on price, value and quality. This is a unique city, we are a unique hostel. Our friendly happy staff are on hand to help you enjoy the most of your time in Belfast. We do not accept bookings for more than 6 people. If you wish to make a group booking, you must e-mail us before booking for permission. Separate bookings are not accepted, your whole group will be turned away without a refund. We are NITB approved and are happy to arrange good quality black-taxi-tours to the peace wall and murals for all our guests. We highly recommend one of these tours to fully experience Belfast interesting past. 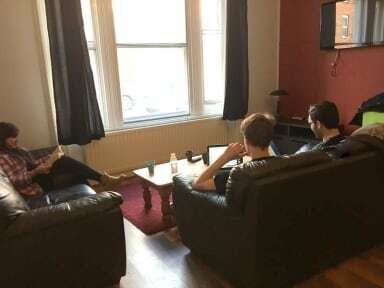 Paddy's Palace Hostel ['the Belfast Palace'] is in the best location for visitors to our unique city. We are in the university quarter which means a safe and secure area, politically neutral and welcoming. Also close to great student nightlife. We are 1 minute from Queens University, Ulster Museum & botanic gardens. We are 15 minutes walk from City Hall. We are in the midst of the best pubs, bars & cafes, frequented by locals, students & visitors alike. A full-size supermarket is minutes away and we are 500metres from a Starbucks (love-em or hate-em). 364 days per year, we offer our guests the chance to escape to the majestic cliffs and sandy beaches of our north-coast on a fun & informative guided-tour in a luxury coach to the 'must-see' attraction for every visitor to Northern Ireland. See Europe's most magical geological formations. Learn of how our legendary ancestor, Finn McCool the Celtic giant defeated his Scottish rival, dressed as a baby! Tour departs @ 10am from the Europa Hotel, returns 5pm approx. We aim to ensure you have a fun-filled stay in a safe, clean, comfortable environment and meet travellers and friends from all over. We also want you to learn more of the history of our proud, fascinating city. -We provide private rooms and dormitory rooms ranging from 2-10 beds. -We have a big kitchen and our dining area is spacious, leading into our large walled garden (complete with WWII Bomb Shelter). -Our pride and joy is our Georgian drawing room - the scene of great Belfast sing songs, laughter filled conversations and movie nights. -We have newly renovated with funky bathrooms, common areas and rooms. Best of all we provide friendly, expert local advice, advice you can trust and rely on. Please note check-in times are from 3pm until 10pm. Later check-in times will need to be pre-arranged by calling the hostel, regular check-in ends at 10pm. Our reception closes at 10pm, so prior arrangement is essential if you are going to be running late. No guests under the age of 18. It wants few changes and could be better. Cheap but not good enough. Bed and shower were clean. The rest of the property is dirty, spider webs everywhere, sticky tables in the dining room. Staff looked they could not care less. Breakfast was OK, fruit&fibre, milk, tea,toast, jam, chocolate spread, peanut butter. I would not stay there again.